In this year’s Readers’ Choice Awards contest, we had more voters than ever (90,000+ to be exact). 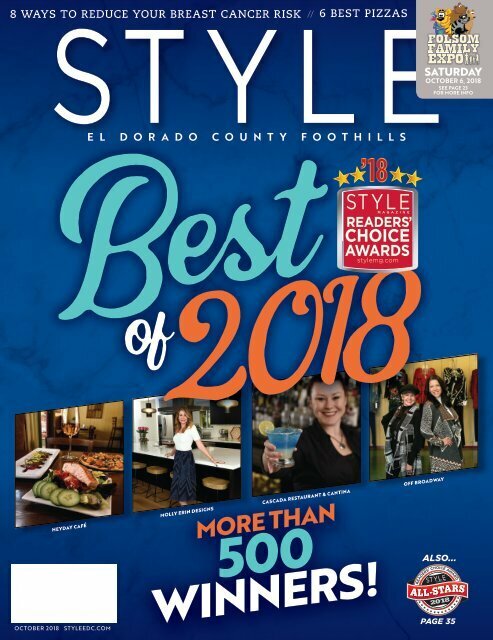 Starting on page 26, read all about the top dogs—whose goods and services run the gamut from food to finance—and let it be a reminder of just how many reputable businesses our region boasts. There’s plenty more in the pages that follow, including “8 Ways to Reduce Your Breast Cancer Risk” on page 18, a roundup of local ways to celebrate Halloween on page 10, and an easy-to-follow itinerary for “A Perfect Day in Apple Hill” on page 8. Enjoy the issue and remember to congratulate and support some of the winners mentioned in this month’s mag. Cheers! Page 34 and 35: BEST WEDDING CAKE/ DESSERT MAKER 1.